newprotest.org: RIVERS OF... SUNNY D? Oh yes. That is a river of Sunny D. Five percent of that river is real juice... and TEN percent of it is sugar. mmmm boy. 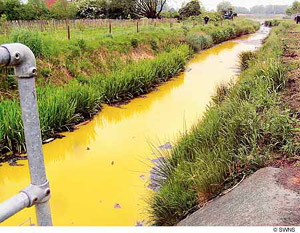 Around 8,000 litres of concentrate used to make the drink leaked into a watercourse on Wednesday morning, turning the river bright yellow. Dozens of fish were found floating on the surface, poisoned by the lurid mixture. The spill of 'sub-standard' juice was a category one pollution incident, the most serious kind, according to the Environment Agency. COMMENTS for RIVERS OF... SUNNY D?